Anne Loughlin (1894-1979) was the first woman president of the TUC in 1943. 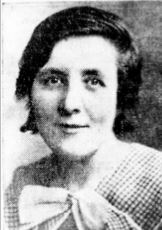 Anne Loughlin, pictured by the Yorkshire Post (7 September 1943). For the first 75 years of its existence, no woman held the post of president of the TUC. It took until 1943 for the TUC general council to elect a woman to chair it. However, their first choice, Margaret Bondfield, who had already served as the first British woman cabinet minister, was unable to see out the full year in office. Citing other work commitments with the wartime coalition government, she stood down – and in her place was elected Anne Loughlin. Loughlin, born in Leeds of Irish descent, had a tough childhood. 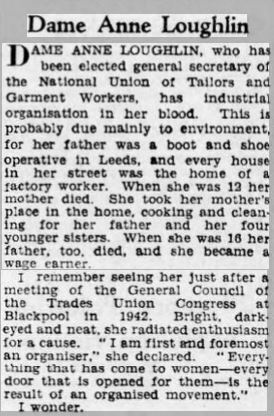 At 12, her mother died, leaving Anne to look after her four sisters; at 16 her father also died, and she became the family’s main breadwinner, starting work at a clothing factory for just 3d an hour. Little else is known of her early working life, but by 1915 Loughlin had become a full-time official for the United Garment Workers Union. 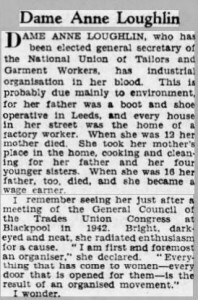 Within the year she was at the head of a strike by 6,000 clothing workers in Hebden Bridge. The union would go through a difficult time in the late 1920s. Tension between the left-wing and largely Jewish or Protestant London branches and the right-wing, Catholic strongholds around Leeds, where the union had its headquarters, led at one point to a Communist-led breakaway union. The bitter in-fighting clarified Loughlin’s position as a union right-winger and protégée of general secretary Andrew Conley, and during the 1930s, as merger led the union to be renamed the National Union of Tailors and Garment Workers, she moved into a national leadership role, serving on a number of government commissions and advisory panels after the outbreak of war. When Loughlin took the chair at the 1943 Trades Union Congress in Southport, she paid tribute both to her “colleague and friend” Margaret Bondfield and to the “organised working women” who were then playing an increasingly large part in the trade union movement. At the end of her term of office, Loughlin was made a dame and asked to serve on the 1944-46 Royal Commission on Equal Pay, where she stood out against the majority line and argued that there was no justification for paying women less than men. Anne Loughlin elected general secretary. From the Yorkshire Post of 6 January 1948. In 1948, Loughlin fought and won election to the post of general secretary, with the vocal backing of Andrew Conley. Her term in office was, however, relatively short, and after working with Harold Wilson, then president of the Board of Trade, to bring about a new Clothing Industry Development Council involving both employers and unions, she stood down due to ill health in 1952. Report of the Proceedings at the 75th Annual Trades Union Congress held at Southport, September 6th to 10th, 1943 on the Union Makes Us Strong website. Records of the National Union of Tailors and Garment Workers can be found in the GMB Collection at the Working Class Movement Library.